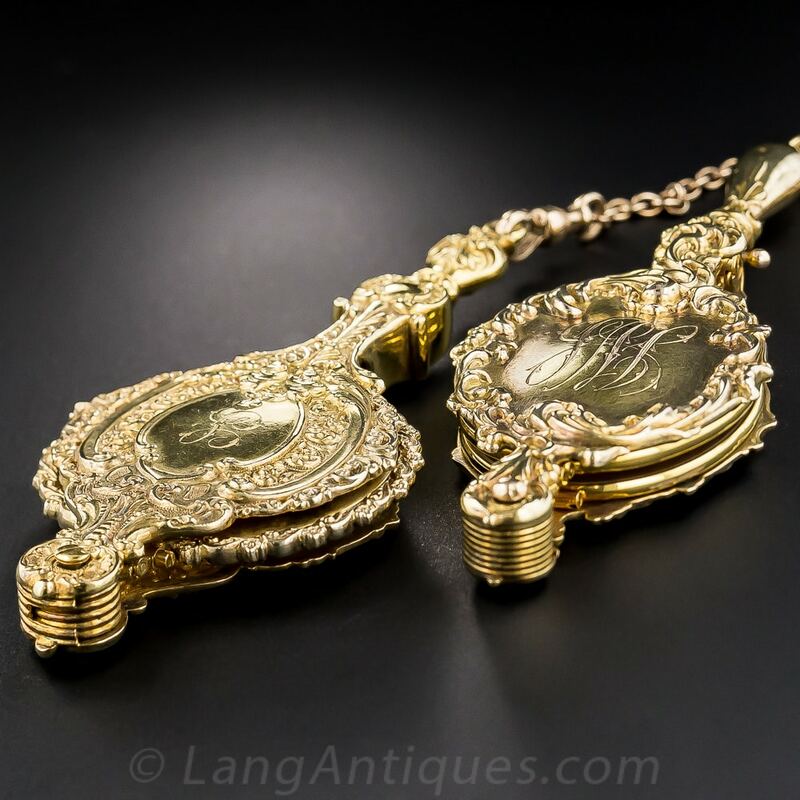 A châtelaine (from French: “lady of the castle”) in its original form is a belt hook, worn by the lady of the castle, from which the keys of the castle were suspended. It was a form of jewelry that had it’s origins in practical use. Through time and innovation châtelainescame to support several chains from which accessoires were suspended. Châtelainesweren’t reserved for women. Men wore them as well. 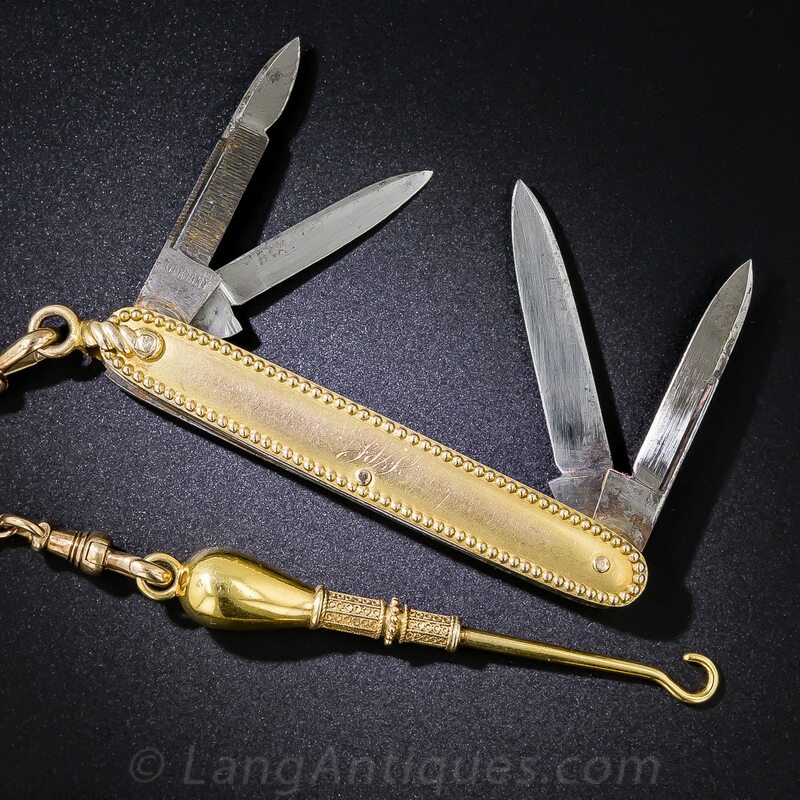 Early examples suspended items like a watch, seal, small pocket knife and a writing instrument. Women’s clothing made no allowance for the need to carry these small but necessary objects, designed as they were with no pockets. The wide belts that were in fashion provided an excellent platform to support large châtelaine hooks and several designs are known to have been manufactured. They began to hang more and varied household tools from their belts to have them handy at all times. 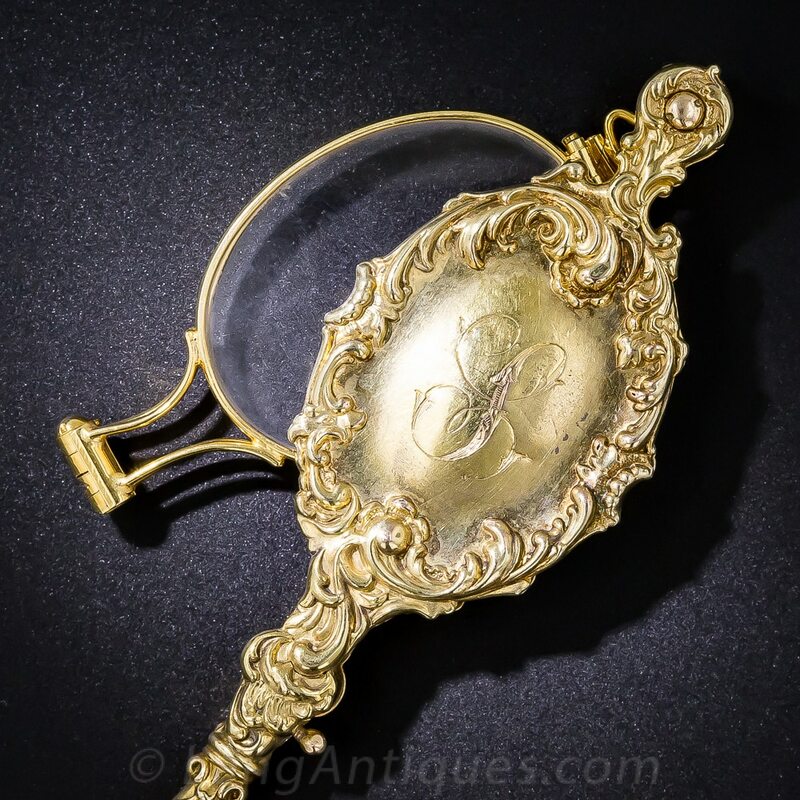 This custom gave birth to the evolution of a functional jewelry piece that is considered to be the predecessor of the modern day lady’s handbag. Châtelaines only lost their popularity when women started to work away from their homes around the start of the 20th century. 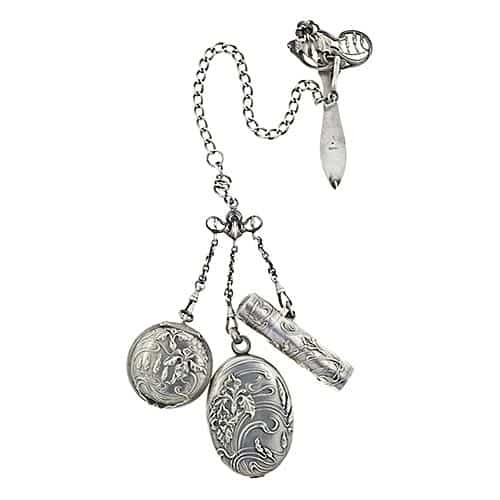 French Art Nouveau Silver Châtelaine. Châtelaines were popular from the 17th to the early 20th century. The prolonged usefulness of the item caused it to appear in a myriad of different styles, following fashion throughout the times. From as early as the early Middle Ages plain rings with chains were used eventually evolving into extremely detailed masterpieces. The Englishwoman’s Domestic Magazine that reported on the fashions in 1874 held that châtelaines were also worn at balls, having hooks suspended from them to hold fans. A spate of châtelaines in the 1878 Exhibition reflected their acceptance in formal wear. 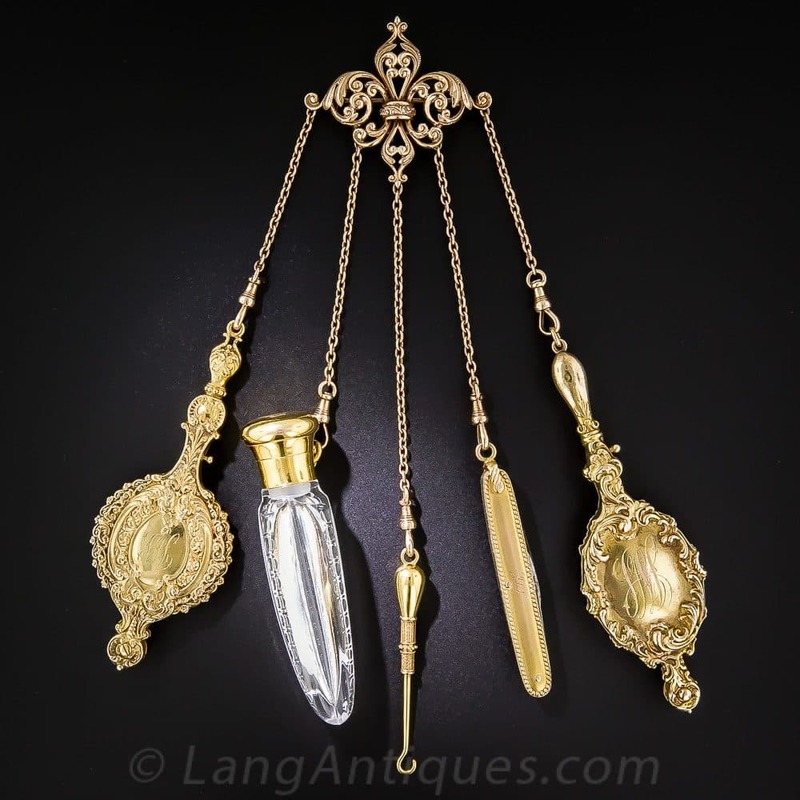 A typical lady’s châtelainewould suspend important keys, a pencil with a small ivory sheet to write, purses, étui, pomanders, vinaigrettes, and scissors or sewing implements and other everyday essentials. 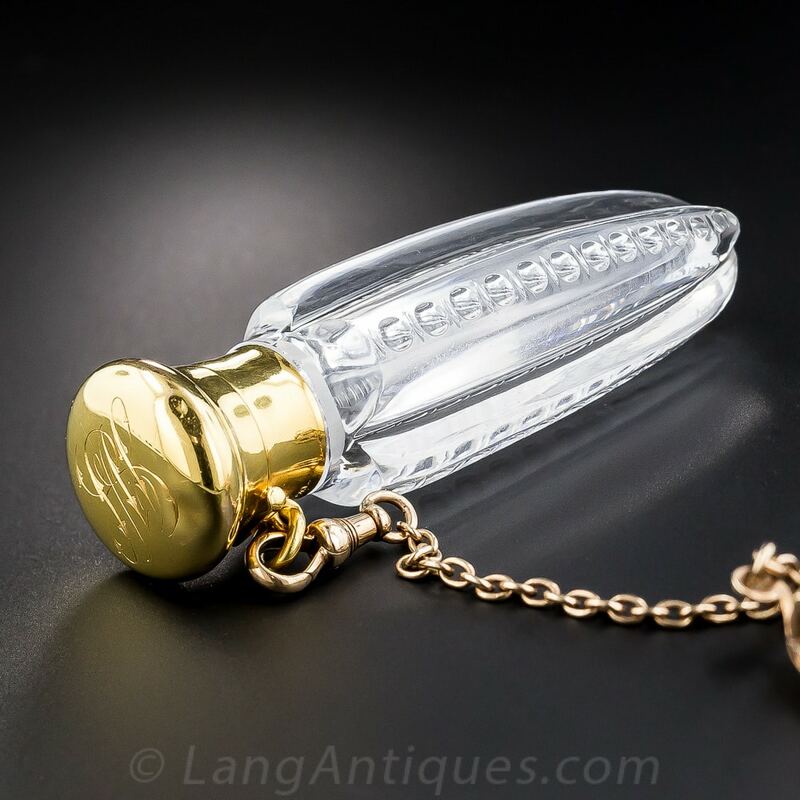 An extensive range of gold and silver, steel and electroplated fittings and appendages came on the market and endless mass manufactured stamped châtelaines, many from German manufacturers, were available in the shops indicating the widespread use and popularity of châtelaines. The general trend towards the early 1900s became that of smaller châtelaines. 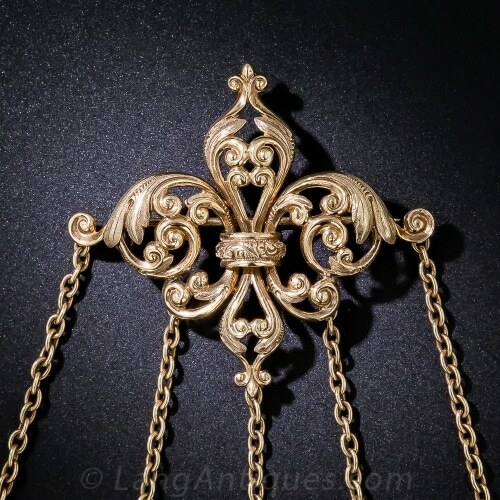 Removable brooches that could be worn separately, decorating the tops of the châtelaines, became fashionable. The beginning of the 20th century marked the end of the châtelaine although modern-day seamstresses still like to use them for practical reasons. Multi-Blade Utility Knife and Button Hook. 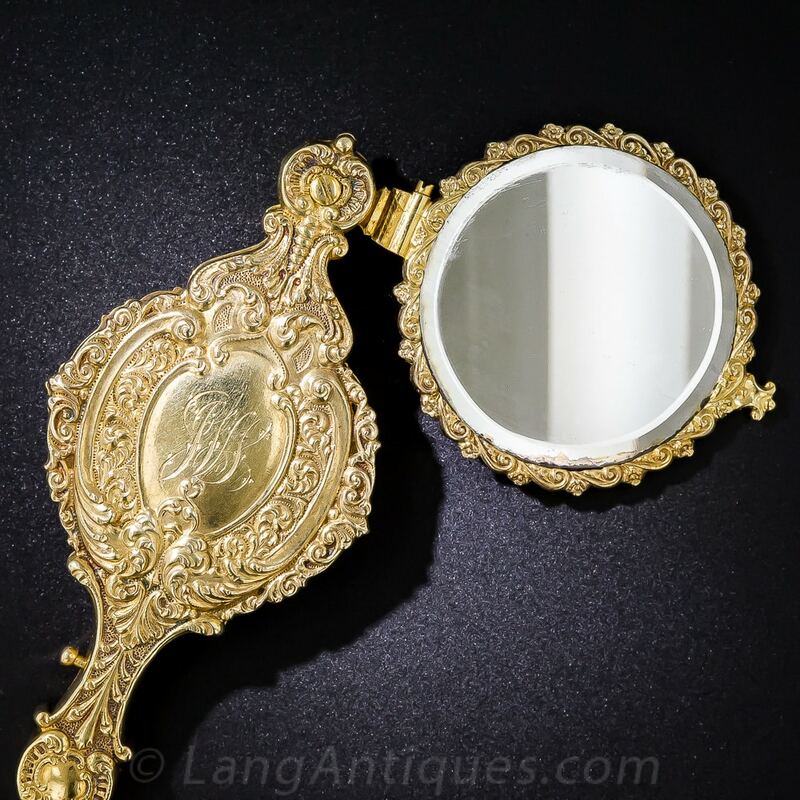 Mirror and Lorgnette Outer Decorative Coverings.